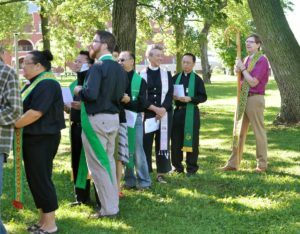 Holy Apostles is our partner congregation, located in St. Paul and it is a predominantly Hmong community. We have partnered on several events including youth mission trips and our Annual Parish Picnic. See this Episcopal News Service article for more about our relationship. What the ladies had made for St. John’s is the Hmong traditional Paj Ntaub (Flower Cloth) – Elephant’s foot, because the middle design is created like the elephant’s foot print, so that is how it got its name. This artistic tradition of paj ntaub is a traditional form of Hmong textile work that combines embroidery and reverse applique techniques. These were used to form geometric patterns in fabric that have had specific symbolic meanings. As the Hmong faced the upheaval of war and immigration, their textile traditions have both provided a link for Hmong Americans to continue perpetuating our culture, as well as evolving to encompass new experiences. While in the refugee camps in Thailand, paj ntaub techniques evolved and artists began creating Story Cloths, embroidered picture textiles that illustrate experiences of the Hmong people, from scenes of agricultural life into images of the war and their exile from Laos. St. John’s also partners with Holy Apostles and their local farmers by providing our parking lot as a location for a Farmers’ Market each Wednesday and Sunday throughout the summer. This provides farmers with an opportunity to sell their fresh produce and flowers. This is also a great opportunity to contribute to Holy Apostles Fields to Families Program. Donations to the program are collected at the Farmers’ Market during the summer and used to purchase produce from the farmers. This produce is then delivered to our neighborhood food shelf, Hallie Q. Brown. Since 2011, tens of thousands of pounds of fresh produce has been donated, feeding hundreds of families with healthy produce and supporting local Hmong farmers. Circle of the Beloved is the Minnesota chapter of the Episcopal Service Corps. Young adults spend their service year living simply and prayerfully together and following the way of Jesus, while promoting justice for the marginalized in their community and challenging systemic racism in housing, education, income, and access to opportunity. Their vision is Kinship Across Lines of Difference. St. John’s partners with them to support their mission. Click here to watch a video of the Rev. Barbara Mraz from St. John’s interviewing Circle of the Beloved Director, the Rev. Craig Lemming. Each year St. John’s partners with Interfaith Action of Greater St. Paul on multiple projects, including a program called School Tools. Throughout the summer we collect school supplies for kids returning to school and Interfaith Action distributes the supplies to children in need. St. John’s and Interfaith Action also partner up on a program called Project Home. Through Project Home, St. John’s helps out every February by hosting a homeless shelter for the month in our gymnasium. This organization works with dozens of faith communities in the area to provide shelter for the homeless. St. John’s partners with the YWCA on multiple programs, including The Giving Tree. This program provides Christmas presents and food for several families. We also provide ongoing support for families through our involvement with Hearts to Homes in partnership with the YWCA. Click here for an article describing the impact Hearts to Homes has had in the St. Paul area. This program is dedicated to stabilizing the lives of families at risk by providing financial assistance toward safe, affordable housing and volunteer mentors to support, encourage and inspire the heads of the households as they work towards becoming financially independent. 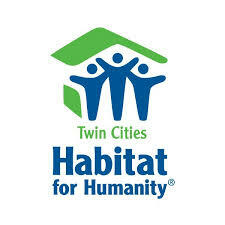 St. John’s is a member of Faith Builders, a group of local churches that partner with Twin Cities Habitat for Humanity to improve affordable housing in the Twin Cities. Every summer volunteers from the five area congregations come together to make a difference! Food shelf donations collected at the church are delivered to Hallie Q. Brown Community Center. St. John’s has adopted the May Household at the Episcopal Church Homes and makes visits quarterly to our elderly friends. Internationally, St. John’s makes an impact through partnership with a St. Paul non-profit called Give Us Wings. This organization does work in four communities in Africa, and St. John’s selected the community of Kayoro Village, Uganda and the building of a clinic to be the centerpiece of our outreach. The St. John’s Clinic Kayoro opened its doors in January, 2012 and is now actively serving those in need.